The Battle of Singapore was fought January 31 to February 15, 1942, during World War II (1939-1945) between the British and Japanese armies. The British army of 85,000 men was led by Lieutenant General Arthur Percival, while the Japanese regiment of 36,000 men was headed by Lieutenant General Tomoyuki Yamashita. On December 8, 1941, Lieutenant General Tomoyuki Yamashita's Japanese 25th Army began invading British Malaya from Indochina and later from Thailand. Though outnumbered by the British defenders, the Japanese concentrated their forces and utilized combined arms skills learned in earlier campaigns to repeatedly flank and drive back the enemy. Quickly gaining air superiority, they inflicted a demoralizing blow on December 10 when Japanese aircraft sank the British battleships HMS Repulse and HMS Prince of Wales. Utilizing light tanks and bicycles, the Japanese swiftly moved through the peninsula's jungles. Though reinforced, Lieutenant General Arthur Percival's command was unable to halt the Japanese and on January 31 withdrew from the peninsula to the island of Singapore. Destroying the causeway between the island and Johore, he prepared to repel the anticipated Japanese landings. Considered a bastion of British strength in the Far East, it was anticipated that Singapore could hold or at least offer protracted resistance to the Japanese. To defend Singapore, Percival deployed three brigades of Major General Gordon Bennett's 8th Australian division to hold the western part of the island. Lieutenant General Sir Lewis Heath's Indian III Corps was assigned to cover the northeastern part of the island while the southern areas were defended by a mixed force of local troops led by Major General Frank K. Simmons. Advancing to Johore, Yamashita established his headquarters at the Sultan of Johore's palace. Though a prominent target, he correctly anticipated that the British would not attack it for fear of angering the sultan. Utilizing aerial reconnaissance and intelligence gathered from agents that infiltrated the island, he began to form a clear picture of Percival's defensive positions. On February 3, Japanese artillery began hammering targets on Singapore and air attacks against the garrison intensified. British guns, including the city's heavy coastal guns, responded but in the latter case, their armor-piercing rounds proved largely ineffective. On February 8, the first Japanese landings began on Singapore's northwest coast. Elements of the Japanese 5th and 18th Divisions came ashore at Sarimbun Beach and met fierce resistance from Australian troops. By midnight, they had overwhelmed the Australians and forced them to retreat. Believing that future Japanese landings would come in the northeast, Percival elected not to reinforce the battered Australians. Widening the battle, Yamashita conducted landings in the southwest on February 9. Encountering the 44th Indian Brigade, the Japanese were able to drive them back. Retreating east, Bennett formed a defensive line just east of Tengah airfield at Belem. To the north, Brigadier Duncan Maxwell's 27th Australian Brigade inflicted heavy losses on Japanese forces as they attempted to land west of the causeway. Maintaining control of the situation, they held the enemy to a small beachhead. Unable to communicate with the Australian 22nd Brigade on his left and concerned about encirclement, Maxwell ordered his troops to fall back from their defensive positions on the coast. This withdrawal allowed the Japanese to begin landing armored units on the island. Pressing south, they outflanked Bennett's "Jurong Line" and pushed towards the city. Aware of the deteriorating situation, but knowing that the defenders outnumbered the attackers, Prime Minister Winston Churchill cabled General Archibald Wavell, Commander-in-Chief, India, that Singapore was to hold out at all costs and should not surrender. This message was forwarded to Percival with orders that the latter should fight to the end. On February 11, Japanese forces captured the area around Bukit Timah as well as much of Percival's ammunition and fuel reserves. The area also gave Yamashita control of the bulk of the island's water supply. Though his campaign had been successful to date, the Japanese commander was desperately short of supplies and sought to bluff Percival into ending "this meaningless and desperate resistance." Refusing, Percival was able to stabilize his lines in the southeast part of the island and repelled Japanese attacks on February 12. Slowly being pushed back on February 13, Percival was asked by his senior officers about surrendering. Rebuffing their request, he continued the fight. The next day, Japanese troops secured Alexandra Hospital and massacred around 200 patients and staff. Early on the morning of February 15, the Japanese succeeded in breaking through Percival's lines. This coupled with the exhaustion of the garrison's anti-aircraft ammunition led Percival to meet with his commanders at Fort Canning. During the meeting, Percival proposed two options: an immediate strike at Bukit Timah to regain the supplies and water or surrendering. Informed by his senior officers that no counterattack was possible, Percival saw little choice other than surrender. Dispatching a messenger to Yamashita, Percival met with the Japanese commander at the Ford Motor Factory later that day to discuss terms. The formal surrender was completed shortly after 5:15 that evening. 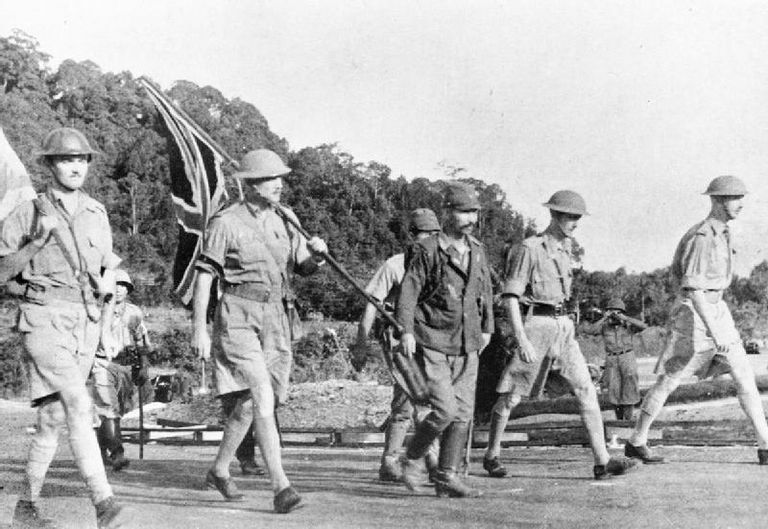 The worst defeat in the history of British arms, the Battle of Singapore and the preceding Malayan Campaign saw Percival's command suffer around 7,500 killed, 10,000 wounded, and 120,000 captured. Japanese losses in the fighting for Singapore numbered around 1,713 killed and 2,772 wounded. While some of the British and Australian prisoners were kept at Singapore, thousands more were shipped to Southeast Asia for use as forced labor on projects such as the Siam–Burma (Death) Railway and Sandakan airfield in North Borneo. Many of the Indian troops were recruited into the pro-Japanese Indian National Army for use in the Burma Campaign. Singapore would remain under Japanese occupation for the remainder of the war. During this period, the Japanese massacred elements of the city's Chinese population as well as others who opposed their rule. Immediately after the surrender, Bennett turned over command of the 8th Division and escaped to Sumatra with several of his staff officers. Successfully reaching Australia, he was initially regarded as a hero but was later criticized for leaving his men. Though blamed for the disaster at Singapore, Percival's command was badly under-equipped for the duration of the campaign and lacked both tanks and sufficient aircraft to achieve victory on the Malay Peninsula. That being said, his dispositions prior to the battle, his unwillingness to fortify Johore or the north shore of Singapore, and command errors during the fighting accelerated the British defeat. Remaining a prisoner until the end of the war, Percival was present at the Japanese surrender in September 1945.